This month’s carnival has some great posts featuring some of our favorite things. Visit the following blogs for great reviews and more. Discover what interesting things you can do with a Sharpie marker in your basement. Check out the basement of this Lexington, KY home. See some great examples of Moleskine Art at You the Designer. Diane at Pocket Blonde has gone to the dogs with Monami Love Pet Pens. Check out her review of colorful markers that will have you panting for more. See why Clement at Rants of the Archer is seeing red by reading his inky post . Can a ballpoint pen deliver 600 A4 pages of text? Find out now at Tiger Pen’s review of the Caran d’Ache 849 Fluo. Is it a pen, a design tool or both? Find out just what the PHX-1 Design Tool Set can do at The Pen Addict. Have you ever wanted a travel journal that is fountain pen friendly? Check out a great review of the Midori Travelers Journal at Rants of The Archer. Is there really a journal that brings more happiness to the world? Find out at Writers Bloc who reviews the Write Now Journal by Compendium. Find out what Sandra at Life Imitates Doodles thinks about her new 2012 Rhodia WebPlanner. Mille reviews the super-colorful Ciak notebooks at Planer Millie. Read her Ciak Notebook review to find out if they fountain pen friendly. Checkout a beautiful patchwork notebook that can be refilled in sections at Pens, Paper and Ink . . .Whatever. I love the ferris wheel picture included with this post – did you create it yourself? Is it made with pastels? What kind of paper did you use? Thanks for hosting the carnival! 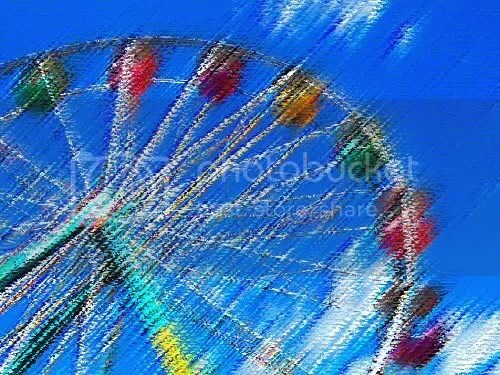 The ferris wheel picture was created by manipulating a photograph in PhotoShop using the pastel filter until I got the feeling I was after. I did not use traditional materials, only the Photoshop filter. t does give it the feeling of being hand-sketched, doesn’t it? Paper � Journaling Arts”. No matter what I personally loved it! The post was named November Carnival of Pen, Pencil and Paper because I was the November host to the Carnival of Pen, Pencil and Paper. Every month, a different blog hosts the Carnival of Pen, Pencil and Paper. The Carnival is for artists, writers, note-takers and anyone else who adores pens, pencils, notebooks, journals, blank books and sketchbooks. The carnival collects the past month’s best posts with reviews, photos, new product news and more to feed the lust of all stationery and office supply fans. Posted the first Tuesday of every month. You can learn more about the carnival here: http://blogcarnival.com/bc/cprof_7671.html. I am glad you like it Corey. This unique article was beneficial. I’m generating out a backup to clearly show my colleagues.